In By Fire, By Water, author Mitchell James Kaplan invites the reader to stand with Luis de Santàngel (Finance Minister to King Ferdinand) at perhaps the most pivotal moment in Spanish history. Here, four events come together around Santàngel, illustrating him as a centrifugal force – seemingly at once controlling and controlled by the historical timeline. The events involved are the Spanish Inquisition, Ferdinand and Isabella (Ysabel)’s campaign against (and subsequent hegemony of) Granada, the exile of Jews from Spain, and Columbus’ “discovery” of the “New World.” Historically, these events did occur near-simultaneously, but in narrative that can become tricky, especially when the main character is involved in all of them. Perhaps for this reason, Kaplan employs a somewhat indefinite timeline. The story seems to float in space, using ambiguous time markers, “some time later,” etc. While this ambiguity is useful, it has its casualties. Many of the supporting characters (male more than female – the female characters in the book are surprisingly strong and make for interesting, complicated studies) get lost in weak side plotlines (Serero, for example, seems to vanish into thin air). Whereas there’s a lack of specificity in terms of time, there is sometimes over-specificity when it comes to historical detail. I speak here specifically, not of Kaplan’s grasp on visceral descriptions such as he uses for Estefan’s wounds or in the novel’s few depictions of murder but, of passages where Kaplan seeks factual accuracy as illustrated in his description of torture devices. Instead of using narrative foreboding, he lapses into stagnant dialogue, forcing the describing character to sound like an encyclopedia. But aside from the minor stylistic deficiencies, this story is rich and, despite my lack of knowledge of this period, it kept me interested. The fictional characters (such as Judith Migdal) are woven together perfectly with those who have real history (such as Judith’s “nephew” Levi, who did in fact exist, by the name of Luis de Torres). My one issue on that point (and the only moment that seemed truly awkward within the narrative) was Torquemada’s vision. It’s the one really supernatural (divine?) moment (unless you count the promising appearance of the vivid rainbow in the sky later on), and it just feels out of place…a stitch or two off, you might say. With the question of religion and the superiority of belief as the debate on the table, it seems curious that the author would include the veritable villain’s vision. But while there is much in the account to weigh on the soul, there is brightness in the message of freedom coupled with hope. It's a really excellent read (I might even call it essential) if you're into Spanish or Jewish history. This period is so often glossed over as "and then Christopher Columbus got permission from Ferdinand and Isabel to go sailing and find a new Westerly route to India, but instead he found the Bahamas," and there's just so much more to it than that. And considering my information on the subject was limited to that, and "The Inquisition" song from Mel Brooks' "History of the World: Part I," I feel much more informed now. 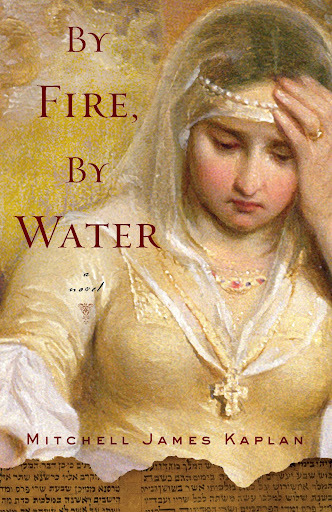 This was my first historical fiction book of 2011. As I said before, I've committed to reading 20 HF books this year. One down, 19 to go!